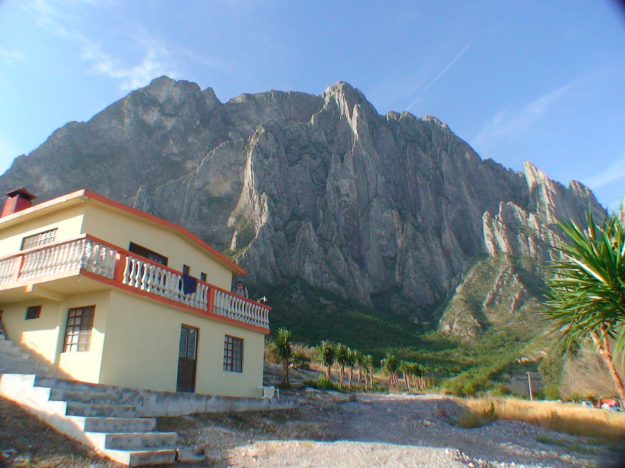 El Potrero Chico (EPC) Mexico, Monterrey (Nuevo Leon)’s premier winter rock climbing destination. 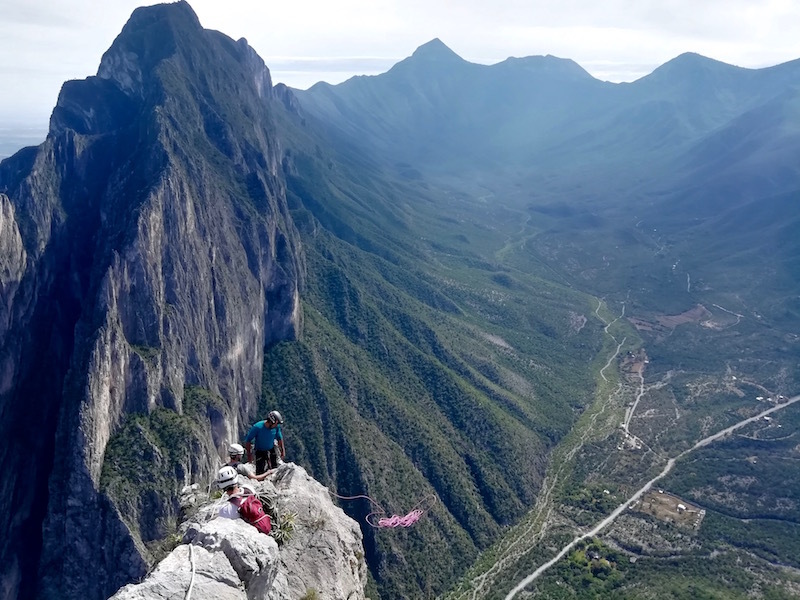 El Potrero Chico is without a doubt, one of the world’s best places to sport climb. Located only a few hours drive from the US border, EPC conveniently shares its prime climbing season with the North American holidays. Making it for a perfect place to get away from the frigid cold up north. After spending a month here in late 2018, I had the time to experience a lot of what it had to offer. It is a magical place which draws you in and doesn’t let you go! 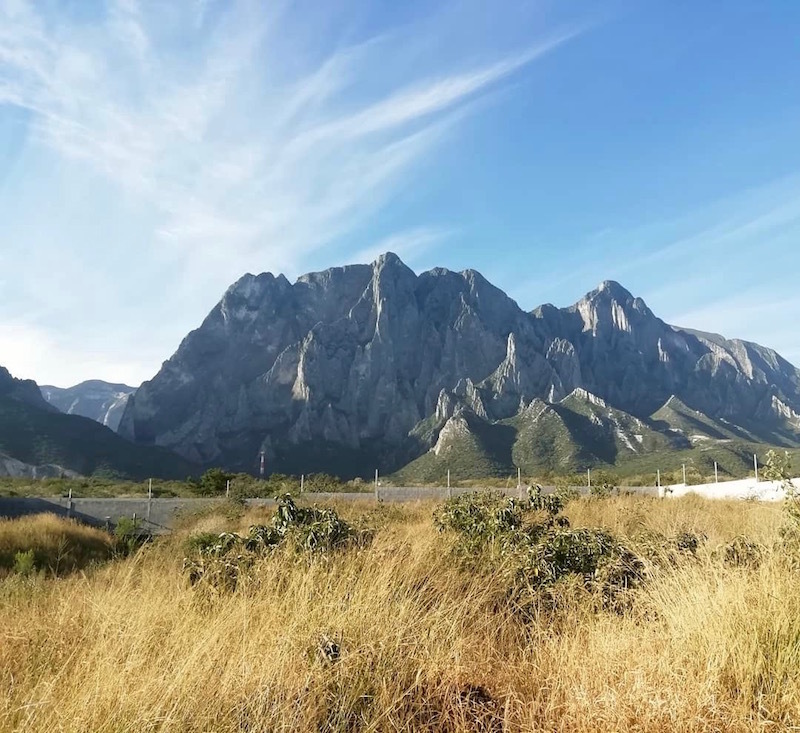 If you’re looking introduction to the area, why you should go, the logistics of how to get to EPC, and advice on getting supplies/ restaurants, check out: El Potrero Chico – Ultimate Climbing Guide Part 1. Oh boy, why we’re all here in the first in the first place. EPC offers one of the longest and most accessible concentrations of sport climbs in the world. The guide book boasts close to 1000 routes, with new development always ongoing. Combine that with nearby El Salto, and this place makes for years of climbing. EPC is certainly somewhere that keeps you coming back for more. What I found separated EPC from most climbing areas is the quantity and quality of excellent moderate multi-pitch routes. Anyone who can comfortably lead 5.10 will have no shortage of things to do. And as I mentioned before in part one of this guide, most of the difficult pitches are aidable, and the rappels are generally very straightforward meaning that you always have the option to bail off if things get out of your comfort zone. Though the routes themselves are generally quite clean, it is worth mentioning that there is a lot of loose rock surrounding the routes, meaning that it is easy to kick off a piece at any time, even on the classics. 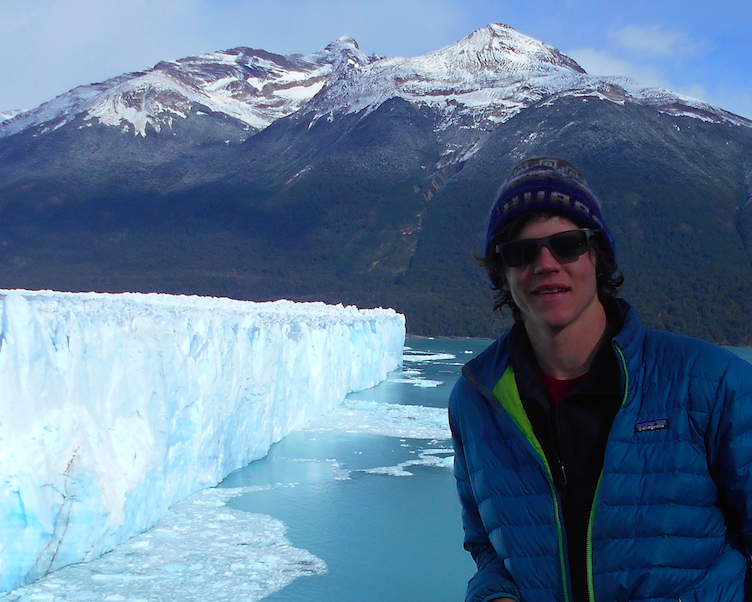 For this reason, a helmet is absolutely essential while climbing here. It is also highly advisable while craging, as many of the multi-pitches climb over the popular cragging areas, keeping the potential for injury constantly present. Also, due to the moderate grades, EPC attracts many beginner climbers, it is common for people to come here to try to their first multi-pitches. Use extreme caution while climbing here. Yankee Clipper – 5.12a 15 pitches – La Selva (Jungle Wall) – Pretty boring until you get to the last two pitches, and get some serious expose facing the front side. Also worth mentioning that the final crux pitch only has a few hard moves, and is easily aidable. Time Wave Zero – 5.12a 23 pitches – Timewave Buttress – Pretty much the highest you’ll ever be able to climb with sport gear alone. The view is worth the journey. The 5.12a crux pitch can be mostly aided, however you’ll have to at least pull through one or two hard moves to clip the next bolt. Land of the Free – 5.12b PG-13 10 pitches – One of my favorite multis I climbed here. I warn you though, the bolts on the easy pitches are spaced out and quite dirty. However, the climbing between pitches 5 to 9 was the most consistent stretch of superb 5.11+ climbing I have ever encountered. The last pitch, also the crux, wasn’t very memorable, I suggest just skipping it. El Sendero Luminoso – 5.12d 15 Pitches – The king line at EPC. Made famous by Alex Honnold after is 2014 free solo, the route has become an essential hard multi test piece. Hype aside, the climbing is excellent. One of the best EPC has to offer. If you wish to bivy, there is a perfect camping space after pitch 5, greatly lowers the level of commitment needed to climb. This should give you a good mix of styles and grades to start with. There are many more worth trying! Once again, I defer to the guide book. Though overshadowed by the abundance of multi-pitches, I found the craging here to be excellent. And trust me, you get tired of hanging on your harness all day, so you’ll eventually want to try out some of the single pitches EPC has to offer. Now once again, i’m not going to go into too much beta on the routes. I’ll simply give a few areas I found to be of higher quality. Check out the guidebook for much more information. Surf Bowl – Steep and powerful, tufas, knee bars, and heel hooks galore. This is limestone at its finest. Not to mention, Surfer Rosa (5.13a/b) is arguable one of the best routes in North America. So if you climb the grade is is an absolute must do. Club Mex Wall (Las Estrellas) – One of the highest concentration of 5 star classics at EPC. The rock is bomber vertical technical face climbing at its finest. Fear of Flying (5.12a) is 30m of absolute perfection… possibly the best 5.12a at EPC. Nearby there are other classics at similar grades to choose from such as Salty Dog (5.12a), Conflict (5.12b, excellent), The Sword (5.12a) and Club Mex (5.12c). Also, it is in the shade all day, meaning that it is one of these places to go on hot days. Outrage Wall – Another one of the highest concentration of 5 star routes at EPC, also home to El Sendero Diablo (5.11c), an excellent 6 pitch multi. As far as single pitches go, some of the must does are: Celestial Omnibus (5.12a, also arguably the best at the grade at EPC), British Invasion (5.12a) and Habanero (5.12b). The only real downside of climbing here is that Outrage gets cooked in the direct sun for most of the day, meaning you’ll have to save it for when the temps are right. El Fin de Semana – Located right off the road (about a 2 min approach), Fin de Semana doesn’t seem to get the attention it deserves. The climbing here is vertical and very technical. Hombre de Rifle (5.13a) is one of the best climbs I’ve ever done, and is another must do for the grade. The wall gets shade until about 1pm, then goes back in the shade around 4pm. 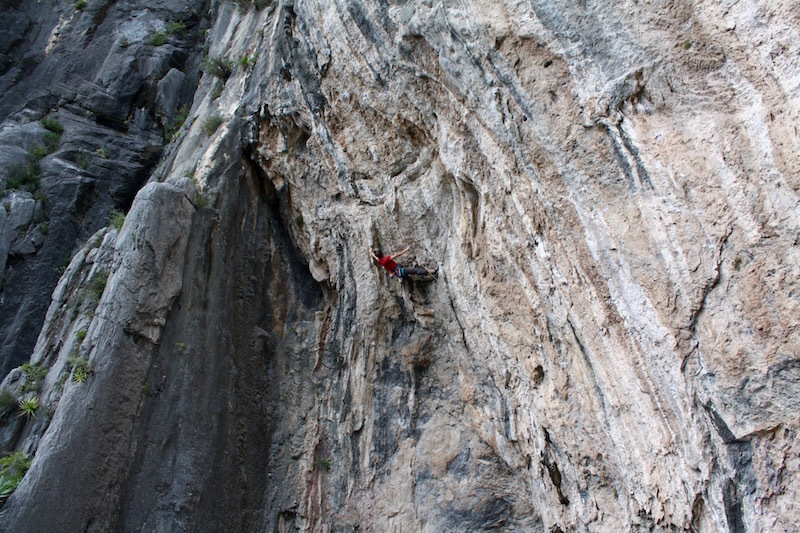 TNT Wall – An excellent crag, with a good mix of grades. Pretty much every climb here is worth doing, Baked Fresh Daily (5.10c) and Band of Brothers (5.10c) are excellent moderate climbs, and Inglorious Bastards (5.12a) is another harder classic. Has shade until about 2pm, then goes back in into the shade at about 4:30pm. Mota Wall – Probably the best place to find moderate climbs, with most of the classics ranging from 5.9 to 5.11c, just pick your grade and enjoy. For this reason, this crag can get pretty busy during the peak months. Sun from about 10:30am on. Virgin Canyon – One of the first crags developed at EPC, and arguably, still one of the best. It is home to a few absolute classics like Selam (5.10a), Milk Cow Blues (5.10c), Mexico in Flames (5.11c) and Don Quixote (5.11d). There is something here for everyone. This coupled with all day shade makes for a super popular crag, it is an absolute must visit. I could go on, but like I said, I suggest taking a look at the guidebook once you arrive. EPC is pretty much 100% bolted. Even the lines which could be protected with gear have been drilled. This makes for planning your equipment pretty easy. One thing to note, a 70m rope is absolutely necessary here, especially if you plan on linking pitches on multis or simul rapping (which are both necessary techniques to save a lot of time). I would suggest bringing a minimum of 15 quickdraws, put 20+ isn’t a bad idea if you’re planning on linking pitches. There is a lot of loose rock here, and rockfall is extremely common. For that reason, a helmet is an absolutely essential piece of safety gear. There are two places nearby where you can buy gear, one being the office at La Posada campsite. The other being Edgardo’s shop. Edgardo is a local legend, who runs a climbing shop, pizza and margarita stand out of a trailer pulled by his van. He can be found in the canyon parking in the afternoon on most days. The guide book can also be purchased where gear is sold, the campsites, and El Buho. It is also available for download on Rackup. If you’re planning on camping, you’ll luckily not have to worry about brining cooking supplies, as all the campsites have fully equipped kitchens. There are a range of choices available, though they’re all pretty much the same. A very large portion of the people who come to EPC camp, which is a great option, as it is cheaper, there is always space, and you have full access to the bathroom and kitchen facilities. Also I’d like to note, for all of you van lifer’s out there, all of the places I’m about to mention allow people to stay in there cars. They charge the same rates as camping. La Posada is the most popular spot for climbers to go. For that reason, also one of the busiest and most expensive. Camping cost about 150MXN a night, and rooms cost close to 20-30 USD a night. Rooms get booked well in advance, so make a reservation if you plan on this option. In January of 2019, they completed a new kitchen, which was well overdue. My main complaint of this place is that it is a little more “social” i.e. loud at times. It tends to pull the the weekend warriors or vacationers who are there not only to climb but to let loose. Their restaurant has good coffee (hard to find at EPC). Located about a 15 minute walk from the entrance to the climbing, Ranchero El Sendero is one of the better campsite picks at EPC. This tends to attract a slightly more dedicated climbing crowd, and is also slightly less busy. They have an excellent kitchen set up, with massive refrigerators, ample storage space and about 10 different stove tops to spread out the load during the diner rush. They also recently opened up a bar/restaurant, and have all you can eat buffets every Friday night for 150 MXN (F-ing delicious). 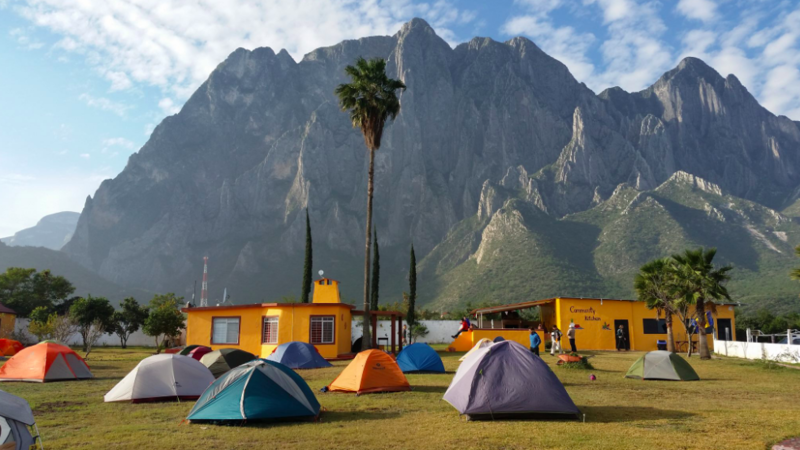 The cost for camping are as follows, 120 MXN a night for the first 10 nights, and then goes down to 110 MXN a night at 11, then decreases further to 100 MXN a night after 30 days. They also offer dorm rooms, private rooms and have a full house available for rent. I would reserve a spot early if you’re going during peak season, as these do fill up every year. By far the least known of the three, La Pagoda has a lot of things going for it. For one, it sees almost zero crowds, even in the busy seasons. Meaning that you’ll actually be able to get some rest her and not have to battle for kitchen space during the peak hours. Also, it is much cheaper than the other options, as they only charge about 70 MXN a night to stay. There are also rooms available for around 20-30USD a night. To downside is that the amenities are more basic, however in no way inadequate. If you’re looking for a more… “rustic” option, this is the way to go. If you’re seeking the full dirtbag experience, look no further. The legend himself, Edgardo, lets people camp at his house for only 40-50 MXN a night. Amenities are understandably less than some of the more expensive options, but those pesos add up! He has a separate kitchen, bathrooms and wifi like all of the others. Edgardo’s does attract a different crowd, and there is a fair bit of partying that goes on here, but you can’t beat that price. He lives about a 15 minute walk further up the canyon away from town. If you’re looking to stay here, just find him in the canyon when he’s working, or ask around. So we can’t climb everyday (sadly), but luckily there are a few good rest day activities to keep you busy. I have already mentioned El Buho and the Tuesday and Friday markets. But if you’re looking for something more, I have included some info on a few other good activities. An excellent (and steep!) 3-5 hour hike. It gives you excellent views of the the front side of EPC. It is definitely worth it, especially if you don’t plan on doing any of the multi-pitches which give you the same view (such as Land of The Free, Yankee Clipper, El Sendero Luminoso, or Timewave Zero). Be warned that it gets cooked in the sun, so bring lots of water and sunscreen. To arrive at the trailhead, head on the same road to the canyon. Once you have crossed the bridge, the trailhead will be on right, after a few minutes walk. The trail is well marked with signs. A topo of the hike can be found here. Located only an hour’s drive from Hidalgo, the San Joaquin Hot Springs are nearby to El Potrero Chico, and offer a great way to relax and recover sore muscles. Not a bad way to spend the afternoon. For more information check out their website. You know have all of the basics needed for an excellent EPC adventure. I hope that you found it useful. EPC is an incredible place, I highly suggest checking it out. As I mentioned before, this is part two of this guide, here we covered info on the climbing, what to bring, and where to stay. 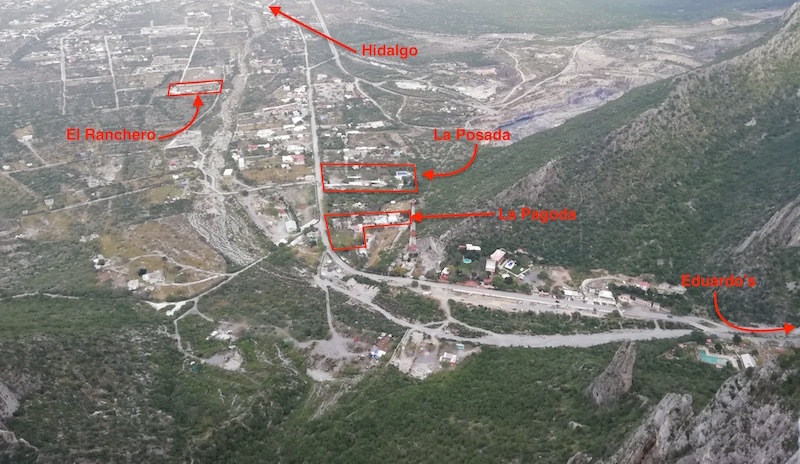 If you’re looking for more information on how to get to EPC, why you should go, and where you should get your supplies and food, see: El Potrero Chico – Ultimate Climbing Guide Part 1. I hope that you found this guide useful. That being said, I’m sure that I missed some things or got them just plain wrong. 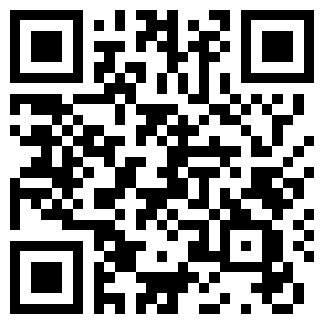 If you see anything, please comment or send me an email. 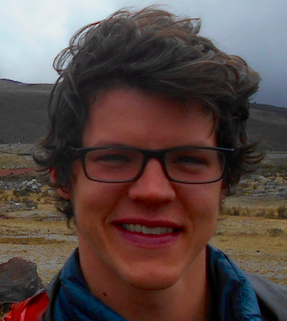 For further reading see: “Northern Ecuador’s Best Rock Climbing” and “4 Reasons Why You Need To Go To Cochamó Now“.